On Saturday, March 20, 2010, I had the pleasure of seeing JD Crowe, one of the greatest banjo players of all time, perform with his band JD Crowe and the New South at the Lyric Theatre in Stuart, Florida. Prior to attending the show, I researched my archives of earlier Banjo Newsletter (see BNL September 1976 and 1982) cover stories of JD Crowe. While JD Crowe’s appearance at age 72, has changed from those earlier issues, his music remains as tight and energetic as ever. You see, when I started playing banjo in 1970, JD Crowe and the New South was one of my favorite bluegrass bands. Next to Earl Scruggs, JD Crowe is one of the true masters of the five-string banjo who I studied and attempted to emulate in my early years. On this night, the crowd was also treated with the performance of Bobby Osborne & the Rocky Top Express. Along with a variety of songs, Bobby Osborne showcased his original composition “Cherokee Lady” on the mandolin and ended with his grand finale “Rocky Top”, which he said was written in 1967 and released on Christmas Day. At the end of the concert, both JD Crowe and the New South and Bobby Osborne & the Rocky Top Express played on stage together. After the performance, I had the opportunity to meet back stage with JD Crowe and ask him a few questions. In particular, I wanted to know how he has managed to maintain a band of bluegrass musicians who are not only outstanding performers but have impeccable vocals. The sound of JD Crowe and the New South is refreshing similar to some of his earliest work. Yet, former band members such as Tony Rice, Ricky Skaggs and Jerry Douglas are obviously no longer part of the group. JD Crowe explained to me that while he gets frustrated losing talented musicians, who have left the band to pursue other musical interests, he carefully maintains contact with potential replacements via phone lists and recommendations he receives from others. As he stated “You really can’t have a great bluegrass band without excellent vocalists”. JD Crowe and the New South have both. 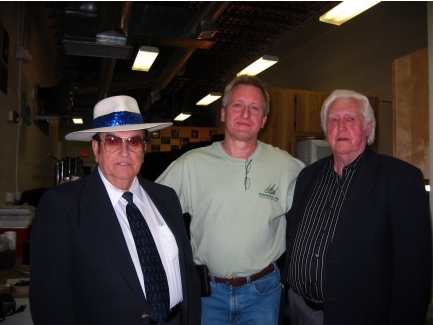 I was surprised to learn that two members of JD’s band, Mark DeSpain on dobro and Cal Perkins on bass have only been with the group since December of 2009. 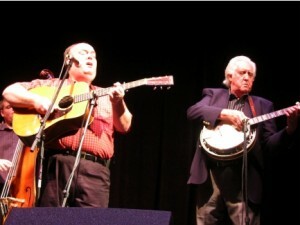 The entire group has only performed since January 2010 with Dwight McCall and Ricky Watson now being the senior members dating back to 1996 and 1998 respectively. Yet, with JD Crowe’s eye for talent, this group performed flawlessly and proved to be an audience favorite. That leaves me with the impression of the master himself. While performing 50-52 shows a year, JD Crowe hasn’t lost a step. 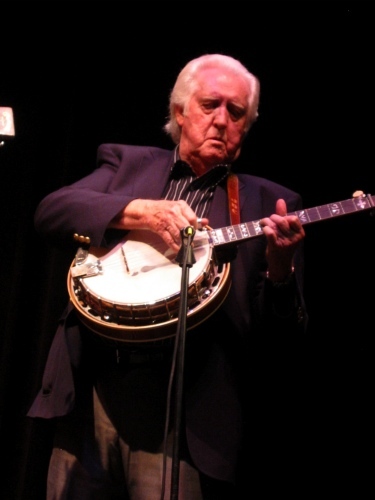 He still drives a bluegrass band with passion and when you see him playing the five–string banjo on songs like “Fireball”, Scruggs’ “Flint Hill Special” or his own standard “Old Home Place”, you recognize that you have truly seen one of the best in the business. This entry was posted in Banjo, Concerts & Festivals, Mandolin and tagged Bobby Osborne, JD Crowe, JD Crowe and the New South. Bookmark the permalink. Seems that every time they come to South Florida…I’m out of town….next year maybe, if I’m lucky!